Last November, we explored how to set up and use Setmore’s built-in automated email confirmation and reminder system. Now we’ll explore text reminders, a feature that comes with your paid Setmore Premium subscription. Text reminders are easy to set up, even if you primarily use the Setmore mobile app for iOS or Android. 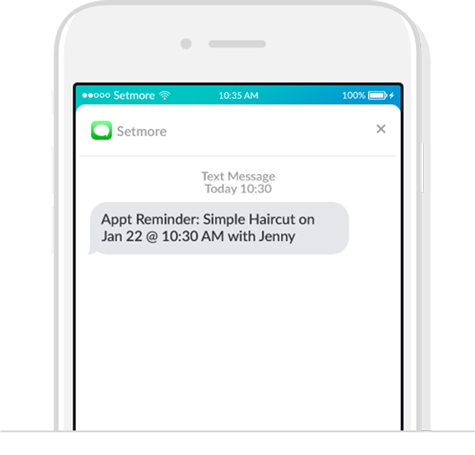 Just activate text reminders in the Setmore web app, and Setmore will take care of the rest while you continue to book appointments from your phone. As previously mentioned, text reminders are included with your Setmore Premium subscription, therefore you will need to upgrade to activate text reminders in your account. Before we begin, it’s important to note that you must activate text reminders through the Setmore web app. As of now, the Setmore mobile app for iPhones and Android phones does not include a path to activate this feature. However, the good news is that once the text reminder feature is activated through the Setmore web app, you don’t need to take any additional actions. It will continue working in the background, while you conduct most of your business on the Setmore smartphone app. Log into Setmore from a web browser and navigate to Settings > Notifications > Customer. Note: if you don’t see this option in your navigation menu, this could be because you have a staff loginwith insufficient access level. Contact your account admin to activate the feature. 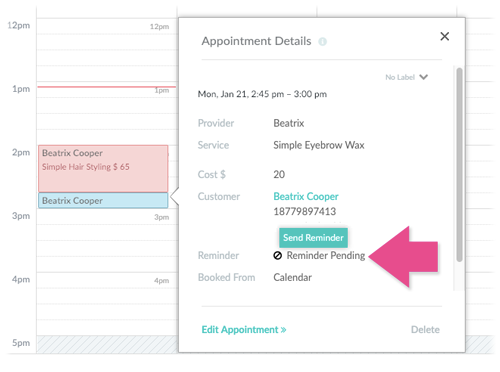 Under Appointment Reminders, check the box to toggle text reminders on or off. Under Reminder Lead Time, use the drop-down menu to set the lead time in days, hours, and minutes. Log into the Setmore web app and navigate to Settings > Notifications > Customization. Under SMS Notification, you will see a grey text field and a blue preview field. Click on the grey text field to edit it, and your changes will automatically show in the blue preview field. While editing, a number of dynamic variable options will appear above the text field. You can drag and drop these into place as you construct your text reminder template. So for example, the “STAFF” variable will always display the booked staff member for the given appointment, and so on. Click anywhere outside the field to save your changes. “Do not reply” – Because Setmore text reminders do not currently support 2-way functionality, this helps ensure that customers aren’t speaking to a wall if they have follow-up questions or comments. Reply to: ###-#### – Adding a reply-to number gives customers the option to text their follow-up questions or comments directly to you or another staff member. This isn’t a foolproof plan, but it does help. Appointment prep info – If customers need to bring specific materials to their appointment, this may be a good place to remind them to do so. Provided you can do it concisely, because the custom template does have a character limit. A quick note on marketing messages: Generally speaking, you don’t want to include marketing jargon in your text reminders because they can be flagged by phone carriers as spam. If you do choose to include promotional messages in this space, be careful with your wording and avoid sounding spammy. Whatever you do, just make sure that your messaging stays helpful and relevant. Most customers regard their text message inbox as highly personal (which may explain why open rates are so high compared to email). So any irrelevant messaging may be seen as a nuisance rather than welcome, and customers can report this as spam.Pro Tip: Want to give customers an easy way to respond to your text reminders? The customizable text template would be a great place to post your Live Booking phone number. You might get a few customers every now and then who report not receiving a text reminder. When this happens, there’s an easy way to check if a reminder was sent to your customer, or if it wasn’t, the reason for the delivery failure. You can check the status of the reminder by clicking any appointment in your calendar to bring up the Appointment Details window. 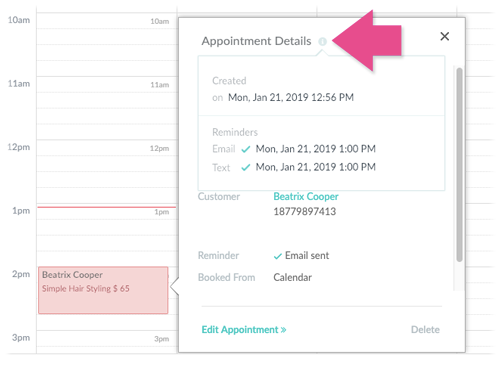 Click the tooltip icon next to the Appointment Details subheader, and a small menu will appear to show the specific reminder status for that appointment. Here you’ll see a confirmation of when the reminder was sent, or if it wasn’t, a specific reason as to why. In most cases, this is because the customer’s phone number was entered incorrectly or the customer entered a landline phone instead of a mobile phone when booking their appointment. If your reminder is still pending, you can trigger it to manually send by scrolling down and clicking the “Reminder Pending” message in the Appointment Details window. Setmore plans to enhance the text reminder experience in the near future. For the time being, there are some limitations you should be aware of. There is only one reminder per appointment – This might change in the future, but as of right now the text reminder sends only once per appointment, at the specified reminder lead time. You can’t send a mass text – Mass email, text, and other marketing tools such as this may be added in at a later date, but for right now you can only send reminders. Text reminder settings aren’t accessible via mobile – As previously mentioned, you can adjust your text reminder settings by logging into your Setmore account at https://my.setmore.com. Not all countries support text reminders – Due to carrier limitations, Setmore cannot send text reminders in some countries. See the next section for instructions on how to verify if your country is supported. Are text reminders supported in your country? This question doesn’t come up very often, and for the majority of countries the answer is yes. However, we’ve included a tool so that you can independently verify if text reminders are a supported feature in your country. Log into Setmore and navigate to Settings > Notifications > Customers. Under Appointment Reminders and adjacent to the Text toggle switch, there will be a link for Test SMS. Click this button. Where prompted, enter your phone number including country code and click Send. The reminder should be received in just a few moments after clicking the Send button. If you don’t receive a text reminder, first verify that the number entered was correctly. If so, your country may not support receiving text reminders from Setmore. Now you’re a pro when it comes to using Setmore’s text/SMS reminder system. We’re coming up on the final part of our journey, where we look at staff notifications and reminders. *Email open rates measured at 40% on average, text reminder open rates measured at 90% on average. Based on internal Setmore marketing statistics, 2019.